Hate groups in America, for the most part, are severely underfinanced and often struggle to find ways to support their activities. But large numbers are using PayPal to sell their products and accept donations, generating fees for that firm, and some are also making significant commissions by advertising Amazon.com’s products. Let’s say you’re in the market for a nice white-power hoodie or the latest CD from the hatecore band Brutal Attack. Or perhaps you just want to give some money to your favorite white supremacist outfit. You’ll probably log onto a hate site, say the Holocaust-denying Barnes Review or the racist White Rabbit Radio, and head to their online shopping carts. And there you’ll more than likely find yourself being asked to use a PayPal account to move money to these organizations. PayPal, a wholly owned subsidiary of eBay, serves as the main financial tool for transferring money to American hate groups, and it earns fees on every transaction that vary in size according to a variety of factors. Research conducted by the Intelligence Report finds that at least 69 of the hate groups listed by the Southern Poverty Law Center (SPLC) rely on PayPal to help finance their activities. Amazon helps sell hate literature like John Derbyshire’s From the Dissident Right. It also pays commissions to hate sites like VDARE when followers shop at the online retailer via a VDARE portal. PayPal has taken steps to stop some hate sites from using its services. The largest and oldest white supremacist Web forum, Stormfront, had its PayPal account yanked some years ago for violation of its policy. Similarly, the neo-Nazi Vanguard News Network (VNN), whose motto is “No Jews. Just Right,” no longer is allowed to use PayPal. PayPal can be so vexing to white supremacists that an entire post on VNN tells readers how to evade its policies by creating anonymous accounts. PayPal is not the only merchant service that serves hate groups, however inadvertently. Over at Amazon, the world’s largest online retailer, it’s possible for hate sites to earn money in a number of ways. Hate groups can and do advertise qualifying Amazon products on their own sites and earn commissions of up to 10%. A neo-Nazi site, for instance, could advertise books about World War II sold by major publishers and earn fees for referring its supporters to Amazon to buy them. In addition, even without advertising specific Amazon products, hate sites can and do encourage their visitors to do all their shopping at Amazon via portals on the hate sites, again generating significant commissions for the sites’ operators. White Rabbit Radio is one of many hate websites that benefit from their relationships with PayPal and Amazon. Amazon also facilitates the sale of publications by hate groups. 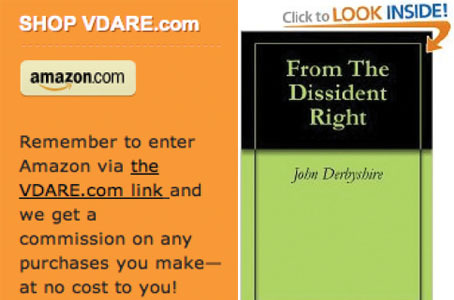 For instance, Amazon sells a Kindle version of John Derbyshire’s From the Dissident Right, published by VDARE.com Books, and earns a small commission for doing so. It’s not publicly known how much money VDARE earns from its relationship with Amazon, but it is likely a fair amount. In the case of the white nationalist book-selling site Counter-Currents Publishing, the site’s operators reported in December that it had earned nearly $20,000 through its referrals to Amazon. Counter-Currents puts it like this: “[T]here is a way for you to help Counter-Currents all year ’round: our Amazon.com Affiliate program. Wouldn’t it be great if you could choose where your sales taxes go? Well, Amazon.com’s Affiliate Program allows you to earmark 7% of your Amazon purchases to Counter Currents at no additional cost to you. That is about the average sales tax that Americans pay,” reads the copy on their site. “It’s simple: just enter Amazon.com from Counter-Currents, and we will receive a cut of anything you buy during that visit at no additional cost to you. That’s anything you buy, from books to DVDs to diapers.” The publishing house says that for about two years it had made about $200 a month through Amazon, but that that number tripled in August of last year. The group also solicits donations through a PayPal account. As of November 2013, Counter-Currents said it had raised nearly $40,000 through that account. Another site that refers supporters to Amazon in return for commissions is the Pioneer Little Europe Kalispell Montana blog. Run by well-known neo-Nazi activist April Gaede, the blog is committed to “creating racially conscious White communities” in Kalispell and elsewhere. In December, it was advertising a radical survivalist book sold on Amazon, Patriots: A Novel of Survival in the Coming Collapse. Similarly, Bob’s Underground Graduate Seminar blog, which is dedicated to “fighting white genocide,” makes referrals to Amazon to fund its activities. The Report contacted Amazon in September about the participation of hate groups and hate sites in Amazon programs that earn them commissions. Amazon said it would assign “appropriate teams to investigate, review applicable policies, and take appropriate action” but that it would not give out “information about any action taken.” Three months later, in early December, the Counter-Currents and VDARE hate sites were still earning commissions through Amazon. For hate groups like Stormfront that have been banned from PayPal there are other options for online money transfers. Stormfront now uses something called eWebcarts.com, an online service that does not appear to be used by any of the other hate sites reviewed by the Report. It is unclear who runs eWebcarts, as it is registered to a proxy and no information about the site appears online. Another option, this one used by a Tennessee-based white supremacist radio show entitled “The Political Cesspool,” is Authorize.net. The racist Sons of Aesir Motorcycle Club uses something called miiduu.com, which also accepts PayPal accounts. The virulently anti-gay organization called You Can Run But You Cannot Hide is powered by Volusion. And North East White Pride, a group of New England neo-Nazis, uses Merchant One. But by and large, PayPal is the service of choice. For more information on Stormfront, see sp.lc/groups-stormfront. Keegan Hankes contributed to this report.